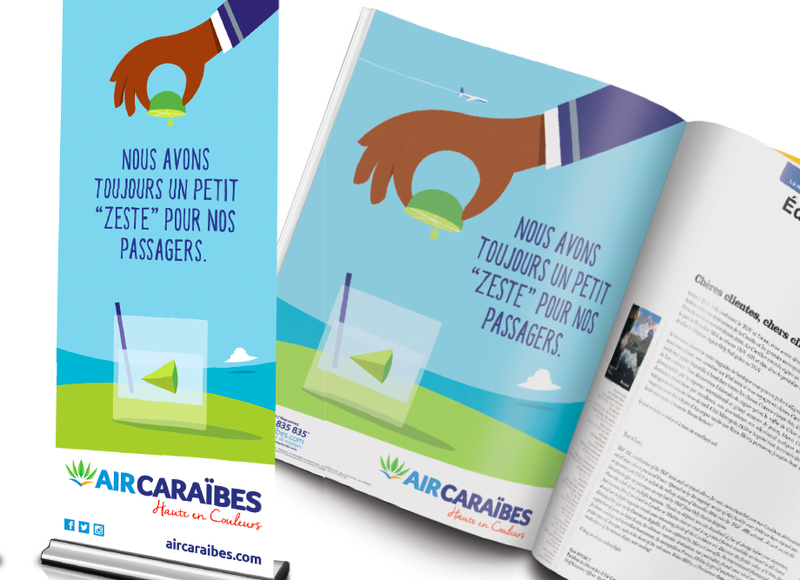 You wouldn’t be blamed for not knowing about Air Caraïbes, the French airline that is based in Pointe-à-Pietre and Martinique Airports in the French Caribbean. Being founded in 2000, it is also a relatively young carrier, but unlike some other transatlantic carriers that connect Europe to the azure seas of Guadeloupe and neighbouring islands, the carrier has invested in a fairly modern fleet, utilising A330s and ATRs, and soon, A350s will join its mix. The carrier, at 15 years old has decided 2015 is the right time for a brand refresh, and has introduced new uniforms and a new brand identity, which has been refreshed by its previous brand agency Lions&Lions. The new brand slogan “Haute en Couleurs” reflects the brand personality, which is bright, vibrant and fun. Air Caribbean also wanted to express how it is anchored in the Caribbean territories through the use of bright, strong and evocative colours. Red pepper symbolises passion; yellow sun to ‘warm smiles’; the blue lagoon which is calm and serene and pistachio green for the exuberance and lushness of its market culture. The carrier also launched new uniforms to match the new brand, which feature duo-tone colour blocking on traditional suiting to offer a brighter, fun element to the experience. What of the carrier? The airline offers economy, premium economy and almost lie flat business class services, which mimic the products found on Air France and their leisure routes as well as fun vibrant and stylish lounges in the Caribbean and Paris Orly airports. We like the new brand image, it’s only a subtle change from their current branding, with the introduction of an illustrative style for their printed advertising. This is what we would have expected from a leisure airline, and it certainly reflects the Caribbean spirit.